The Soilmec SM-20 is a multipurpose hydraulic drilling rig. The modular design is engineered for the execution of micropiles, tie-backs, anchors, jet-grouting, drains, water wells. The rig is fitted with a proportional hydraulic system that makes drilling operations smooth and precise, even in the most difficult operating conditions. 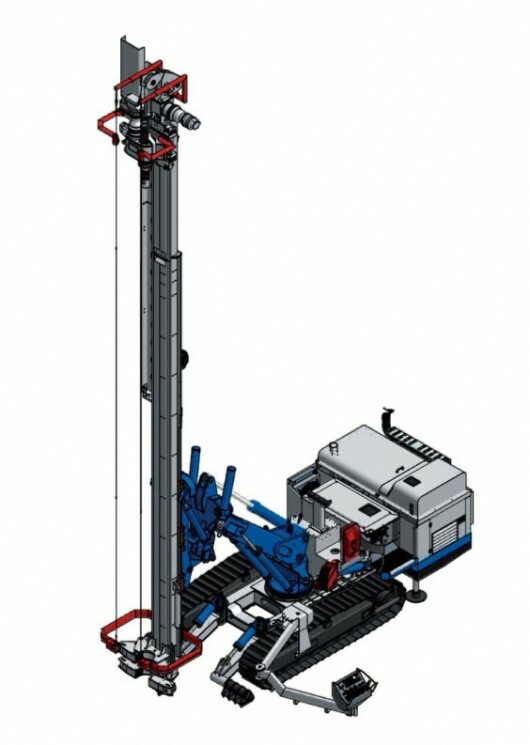 The modular design of the SM-20 includes the stroke of the drilling rig which can be varied from 7200 to 10200 mm (and vice versa) with a simple mast extension (or reduction) kit with hydraulic pipe rack. Various systems for the mechanical loading of the drilling rods are available with depths that range from 18 to 45 m for both vertical and inclined drilling of anchors or tie-backs. The particular kinematic mechanism with a 90° joint allows the drilling of anchors and tie-backs with the rotary drilling over the mast. This particular condition allows the reduction of the mechanical consumption and friction and in particular, work in total safety. The clamp/joint-breaker lets you extract the casings thanks to a lifting system fitted with a hydraulic piston with a 600 mm stroke.